1. Yelena Chernenko article headlined "Chemistry and peace" comments on a historic breakthrough in resolving the Syrian problem reached by Russia and the United States. Russia is to finance some of the work to scrap the Syrian chemical weapons that will not be brought to Russia; pp 1, 8 (965 words). 2. Alexander Chernykh interview "Bill's authors want to change something and report" with Russian Academy of Sciences president Vladimir Fortov speaking on the planned reform of the academy and the future of the organization; pp 1, 4 (2,734 words). 3. Mikhail Serov and Anatoly Dzhumailo article headlined "Gazprom gets ready for frosts" says the gas monopoly Gazprom claims that it will lose 510 billion rubles ($15.4 billion) if the government freezes gas prices for three years. The company claims that individuals will not benefit much from the move; its investment program will be affected and the budget will lose 100 billion rubles in taxes; pp 1, 10 (950 words). 4. Sergei Sobolev article headlined "TV channels approach zero" reports on "revolutionary changes" being prepared on the Russian television market. Broadcasters, advertisement companies and advertisers are going to carry out television measurement in all parts of Russia, while at present only cities with the population of 100,000 people and more are taken into account. Channel One, Rossia TV and NTV are to benefit from the change most; pp 1, 12 (640 words). 5. 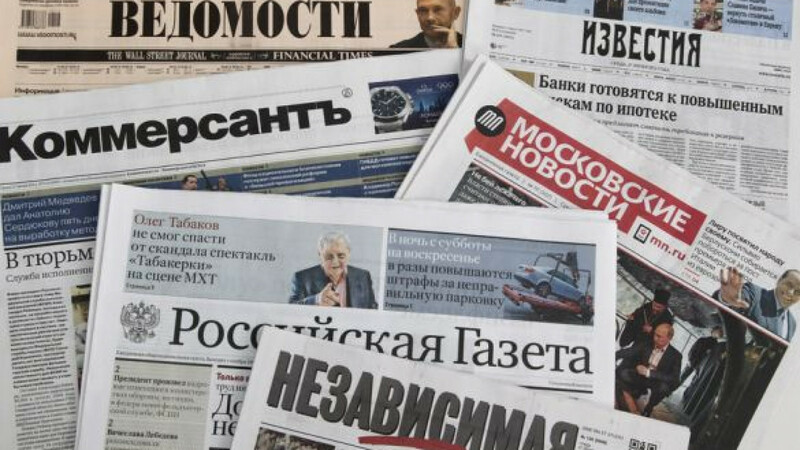 Maxim Ivanov article headlined "It will become harder to open and easier to close media" details some amendments to the law on mass media which experts consider to be discriminating; p 2 (598 words). 6. Andrei Kolesnikov article headlined "FIFA. Dreams come true" says Gazprom and FIFA have become partners up to 2018. President Vladimir Putin met FIFA president Sep Blatter and Gazprom head Alexei Miller; p 5 (778 words). 7. Angelina Davydova article headlined "Air export not to remain unnoticed" says the WWF has warned Russia about the risk of carbon sanctions as measures to reduce carbon dioxide emissions in the EU, the U.S., Japan and China may affect export of Russian goods; p 6 (550 words). 8. Vadim Visloguzov and Anna Solodovnikova article headlined "Oilmen invited for manoeuvres" says that Putin and Prime Minister Dmitry Medvedev have approved the planned changes in oil taxes. Export duty on oil is to be reduced, while oil extraction tax will grow; p 6 (688 words). 9. Maria Yefimova et al. report headlined "American politicians reach out to Russian people" says U.S. Congressman Steve Israel has handed over to Kommersant a letter in response to Putin's article in The New York Times. The Russian presidential press secretary has welcomed the U.S. politician's move to address Russian people; p 8 (543 words). 10. Newspaper publishes an open letter by U.S. Congressman Steve Israel who outlines the U.S. stance on Syria and calls for international actions to prevent the future use of chemical weapons in Syria and in any other country; p 8 (318 words). 11. Galina Dudina interviews Olivier Lepick, an expert from the Foundation for Strategic Research (FRS), speaking on possible challenges in the implementation of the Russian-U.S. plan to place the Syrian weapons under international control; p 8 (579 words). 12. Gennady Sysoyev article in opinion column headlined "Price of issue" notes that some regimes, like former Yugoslavia, used Russia in an attempt to prevent foreign invasion. However, later they let Moscow down. The author urges the Kremlin to learn from Yugoslavia's lessons and call on Damascus to stick to international agreements; p 8 (412 words). 1. Andrei Vaganov article headlined "Academy of Sciences finds out who drafted its reform" says the Kremlin has submitted amendments to the bill on the Academy of Sciences reform to the State Duma; pp 1-2 (998 words). 2. Viktor Litovkin article headlined "Airfields in ice" says Russia is to rebuild its military airfield on one of the Novosibirsk Islands in the Arctic to show its right to the region; pp 1-2 (1,018 words). 3. Yevgenia Novikova article headlined "Lavrov and Kerry deliver strike to militants' hopes" says the results of a UN probe into the chemical attacks in Syria will be made public at the Security Council today. Meanwhile, Damascus has pledged to follow the plan of its chemical disarmament adopted by Russia and the U.S.; pp 1, 6 (715 words). 4. Alexandra Samarina article headlined "Rubbish labour of illegal migrants not to rescue Russia" details a new bill submitted to the State Duma which would require migrant workers coming to Russia to have a $1,500 deposit guaranteeing their timely leave. The government opposes the move; pp 1, 3 (874 words). 5. Alexei Gorbachev article headlined "Political fight up to concussion" says opposition politician Boris Nemtsov is to be questioned by the Investigative Committee today, as a pro-Kremlin activist accuses Nemtsov of beating him up; pp 1-2 (605 words). 6. Igor Naumov article headlined "Banking sector waits for crisis" says a banking crisis is expected in Russia in early 2014; pp 1, 4 (682 words). 7. Editorial headlined "Light at end of Syrian tunnel" welcomes the Russian-U.S. agreement on international control over Syrian chemical weapons and notes that it helped U.S. President Barack Obama cancel his unpopular military operation plan without any damage to his political reputation; p 2 (477 words). 8. Vardan Bagdasarian article headlined "Carte Blanche: UN repeats fate of League of Nations " criticises the role of the UN in international politics and notes that the organization no longer protects weak states and does not control powerful countries; p 3 (738 words). 9. Igor Bakshin report "Dissenters' walkout" says that three State Duma opposition factions have said they do not recognize the results of recent elections in three Russian regions; p 3 (850 words). 10. Alexandra Samarina report "Non-system consistency" looks at the results of the recent elections in Russia; p 8 (800 words). 11. Viktor Litovkin report "North, west, south and everywhere" looks at military exercises carried out by the Russian Armed Forces; p 8 (800 words). 12. Bakhtiar Tuzmulhamedov report "Syrian crisis: Peace potential not exhausted" looks at the situation in Syria and Russia's initiative on Syrian chemical weapons; p 9-10 (2,400 words). 1. Alexandra Terentyeva et al. report headlined "Sechin needs potassium" says Rosneftegaz has joined the fight for the right to buy the potassium manufacturer Uralkali. The state-controlled corporation does not need any bank loans for the deal; pp 1, 12 (634 words). 2. Olga Kuvshinova article headlined "Central Bank finds key" says the Russian Central Bank has started the fiscal policy reform to keep inflation under control and in this way help the Russian economy; pp 1, 5 (672 words). 3. Editorial headlined "How to unite scientists" says the Russian Academy of Sciences reform may turn into a scandal and form a precedent of protest corporate mobilization. Researchers of all levels are discussing plans for non-violent protests in social networks. Experts criticise the reform as it allows bureaucrats to control scientists; pp 1, 6 (349 words). 4. Another editorial headlined "Independent observer" says the U.S. audience has treated Putin's article in The New York Times with irritation; p 6 (344 words). 5. Maria Zheleznova article headlined "Person of week: Yevgeny Roizman" comments on the victory of opposition candidate Yevgeny Roizman in the Yekaterinburg mayoral election; p 7 (337 words). 6. Yelizaveta Sergina et al. report headlined "Kremlin's deputy minister" says the Russian presidential administration wants to appoint Nikolai Senkevich, General Director of the holding company Gazprom Media as deputy communications minister; p 11 (871 words). 7. Polina Khimshiashvili article headlined "Putin gives Obama determent" says Moscow has won a diplomatic victory having agreed with Damascus and Washington about the delay of a U.S. military operation in Syria in exchange for international control over Syrian chemical weapons. The plan will be hard to implement, the author warns; p 3 (457 words). 8. Maxim Glikin report "Alexei Navalny as exception" says that the Sept. 8 elections have shown a crisis of the parliamentary opposition; p 3 (450 words). 9. Olga Kuvshinova article "Macro forecast for resignation" says that the government's main macro-economist Andrei Klepach may leave the Economic Development Ministry; p 5 (700 words). 10. Oleg Salmanov report "Between TV and internet" says that the Communications and Telecommunications Ministry insists that the band 694-790 MHz used by TV should be handed over to mobile communications. TV channels oppose the initiative; p 16 (450 words). 11. Maria Gaidar article headlined "Syrian crisis: To stop being a province" looks at Russia's role in the international arena; p 7 (800 words). 1. Svetlana Subbotina article headlined "United Russia not to allow government to distort president's May decrees" says the United Russia faction in the State Duma has suggested that all ministries draft their contributions to state development programs before the budget hearings begin; pp 1-2 (901 words). 2. Mikhail Rubin and Anastasia Kashevarova article headlined "Election day may stop being Sunday" says the Russian presidential administration is considering ways to increase turnout in elections. Voting may be held on workdays instead of Sundays; pp 1-2 (716 words). 3. Anastasia Kashevarova et al. report headlined "Three deputy mayors to leave Moscow government" outlines the new structure of the Moscow city government being developed by newly elected Mayor Sergei Sobyanin . Around one-third of the mayor's office officials are to be replaced with new figures; pp 1, 8 (1,244 words). 4. Yegor Sozayev-Guriev article headlined "SCO backs Vladimir Putin" says the Shanghai Cooperation Organization has welcomed the Russian plan of international control over Syrian chemical weapons; p 2 (627 words). 5. Natalya Bashlykova article headlined "Patriots tired of reform" says Gennady Semigin, leader of the Patriots of Russia party, wants the law on registering political parties to become stricter to reduce the number of parties; p 3 (675 words). 6. Dmitry Yevstifeyev report "Baumgertner to remain in Minsk prison until November" says that a Belarussian court has left Vladislav Baumgertner, director of the Russian potash giant Uralkali, in custody until November; p 5 (650 words). 7. Olesia Yelkova report "New owner quickly found for Uralkali" says that Vladimir Kogan, banker and former head of Gosstroy, is to become the owner of Russia's potash giant Uralkali; p 5 (650 words). 8. Maria Gorkovskaya and Tatiana Baikova article headlined "Talks between Lavrov and Kerry stumble over need for ceasefire" says the U.S. is only pretending to agree with Russia over the Syrian issue, but in fact, it is waiting for `Syrian rebels to achieve some success in fighting with Bashar Assad; p 7 (698 words). 1. Vladislav Vorobyov article headlined "Syrian cuisine with Lavrov and Kerry" says Russian Foreign Minister Sergei Lavrov and U.S. Secretary of State John Kerry have shown diplomatic "miracles" in negotiating the Syrian chemical weapons deal; pp 1, 6 (1,400 words). 2. Taras Fomchenkov article headlined "They set up network" outlines the Russian Tax Service plans to develop online services for taxpayers; pp 1, 4 (550 words). 3. Yelena Kukol article headlined "Central bank aims at inflation" says the Russian Central Bank predicts that inflation will go down to 4.5 percent in 2014; pp 1, 3 (900 words). 4. Galina Bryntseva report "Where are our children?" says the Russian Foreign Ministry has referred to the underground network of replacing and buying children in the U.S. through the internet ; p 10 (450 words). 1. Natalia Vedeneyeva interview with Viktor Kalinushkin, Chairman of the Russian Academy of Sciences trade union, speaking on discussion of the academy reform at the State Duma; pp 1-2 (500 words). 2. Alexander Minkin article headlined "Russia, Obama, banana" slams State Duma lawmaker and former figure skater Irina Rodnina over her Twitter post showing U.S. President Barack Obama and his wife staring at a banana pp 1-2 (300 words). 3. Viktoria Prikhodko article headlined "Surkov as face of Russian authorities" comments on rumors saying that Vladislav Surkov is to become the Russian presidential aide and to work on the relations with Ukraine; pp 1-2 (400 words). 4. Yelena Berezina report "Andrei Vorobiev during inauguration promised to wash officials' hands" looks at the speech of newly elected Governor Andrei Vorobiev at the inauguration ceremony; pp 1, 6 (750 words). 5. Article by economist Yevgeny Gontmakher headlined "Alexei Navalny's cloudy future" looks at several possible scenarios for opposition activist Alexei Navalny's political future; p 3 (1,000 words). 6. Ilia Baranikas article headlined "Russian-American breakthrough: Where?" looks at the U.S. reaction to the agreement on Syrian chemical weapons reached by Lavrov and Kerry; p 3 (650 words). 1. Konstantin Nikolayev article headlined "War big and war small" comments on Syria's prompt joining the UN convention banning chemical weapons; p 2 (400 words). 2. Mikhail Nikiforenko article headlined "Keep eye on hands" says that policemen, who represent the victim party in the Bolotnaya case, get mixed up while giving testimony. According to pundits, the most scandalous episodes of the case, like the one when judge did not let defendant Mikhail Kosenko attend the funeral of his mother, play into the hands of those interested in the destabilization of the country; p 2 (700 words). 1. Yulia Yakovleva article headlined "To get rid of half of Navalnys" says that the Communist Party (CPRF) has gathered 2 million signatures in support of the present government dissolution and now awaits the initiative to be discussed in the State Duma; p 2 (600 words). 1. Yulia Polukhina article headlined "Remand prison and mother" slams the judge in the Bolotnaya case for not letting defendant Mikhail Kosenko attend the funeral of his mother; p 2 (700 words). 2. Olga Bobrova interview with the Yabloko party founder, Grigory Yavlinsky, on the outcome of the mayoral election; pp 8-9 (1,800 words). 1. Yelena Chinkova article headlined "Rodnina 'shows' Obama banana" features reaction to the scandalous Twitter post retweeted by State Duma lawmaker and former figure skater Irina Rodnina showing U.S. President Obama and his wife staring at a banana; p 3 (400 words).